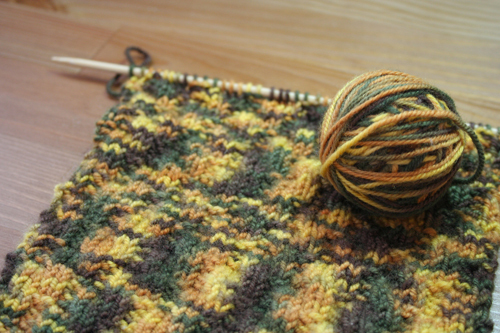 I cracked open my Mirasol collection book to work on this scarf pattern. 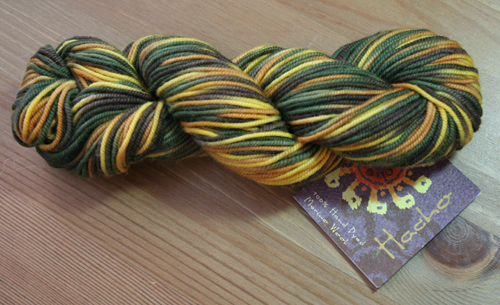 I'm fairly certain this yarn, with shades of brown, green, yellow & muted orange, will go lovely with my brown winter jacket. I have enough to complete a scarf, hat and perhaps even some fingerless gloves. The only problem is I'm not enjoying the stitch in this pattern so the knitting is going excruciatingly slow. The stitches are primarily a switch between knit and purl at different intervals over 12 rows. I can't quite figure out what it is about this pattern because it works up in a nice diagonal. Perhaps it's just a case of stitch boredom? I hate to put it that way as I'm still a long way off from the end. I need some fresh love for "Juan" so that I can get this scarf done before winter ends.